Explore more of the Land of Oz with 56 new Munchkin Oz cards inspired by L Frank Baum's beloved literary world. Beware the danger of a Frozen Heart, turn the tide with the Magic Apron, and use Glinda's Ring to defeat The Supreme Dictator of Flatheads. 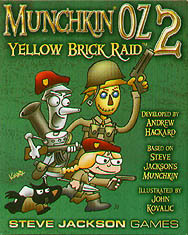 With Munchkin Oz 2 - Yellow Brick Raid, your Munchkin game is more wondrous than ever! This is an expansion for Munchkin Oz. It is not a stand-alone game.